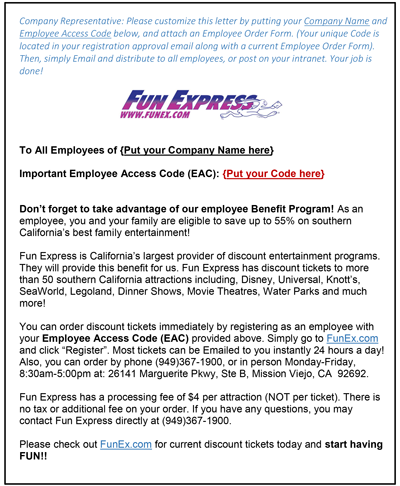 To make the most of your Fun Express Employee Benefit Program, it's important to keep essential information, such as your Employee Access Code (EAC) readily available to employees. It's Easy! Step 1 - Start an email from yourself to all of your employees. Step 2 - Copy and paste Update Program Email into the body of your email and follow the steps provided in the sample. Step 3 - Send email to your employees and relax! Employees will order direct from Fun Express! Include a Current Employee Order Form with your next paycheck distribution.